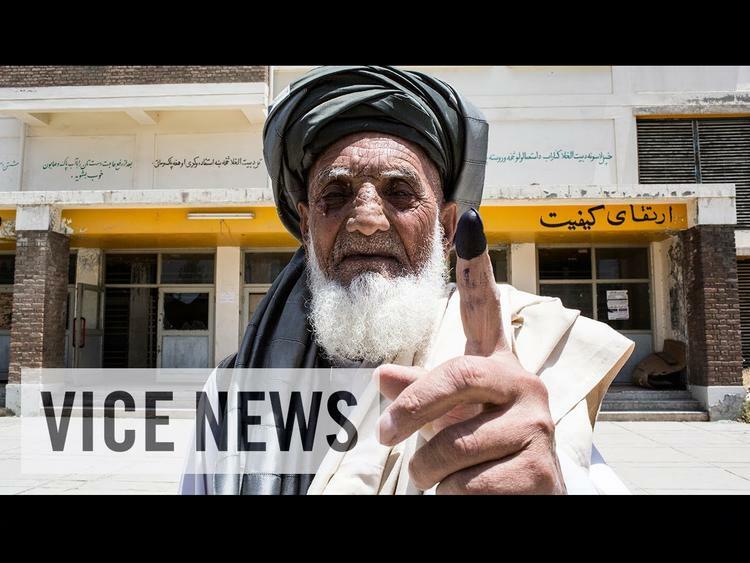 KABUL — As allegations of fraud in Afghanistan’s runoff election pile up, protest movements have mobilized against what they see as systematic vote-rigging. The demands mirror those made by presidential candidate Abdullah Abdullah, who has said the election process is no longer “legitimate.” Abdullah has accused the Independent Election Commission (IEC) and Afghan President Hamid Karzai of orchestrating the election to favor his rival, Ashraf Ghani. Abdullah has also warned that any looming “crisis” is out of his hands. “Death to fraud. Death to those who have committed fraud!” These are among the slogans blaring through loudspeakers to a crowd of several hundred protesters assembled at the site on June 20. The group, which has already set up a dozen tents, says it is not affiliated with either of the candidates, although the majority who spoke to RFE/RL said they had voted for Abdullah. Many of the group’s members wear red scarves in a symbolic show of solidarity. Khudadat says the electoral bodies and the government have crossed a “red line” by being involved in fraud. Khudadat also says the red refers to the blood they are willing to shed to fight for their cause. Ethnic friction is also a concern, as Abdullah — who is half Tajik, half Pashtun — has strong support among the Tajik community. Ghani is Pashtun, the largest ethnic group in Afghanistan. Meanwhile, Amrullah Saleh, the country’s former spy chief and Abdullah supporter, said during an address in Kabul on June 19 that “resistance” needs to be waged against fraud. Saleh’s National Movement, Besij-e-Melli in Dari, has also organized a sit-in protest for the past two days in Kabul. The grassroots political movement, which has adopted the color green, was inspired by the Arab Spring and Iran’s opposition Green Movement. It first emerged on the scene in 2011. One of the National Movement’s chief demands is the immediate suspension of the IEC’s chief electoral officer, Ziaulhaq Amarkhil, who is being investigated for possible ballot-stuffing. Amarkhil was arrested by Kabul’s police chief, General Zahir, on June 14 when he apparently left the IEC headquarters with several cars full of ballot papers.